Bagnato Architects were both the architects and the client for this project. 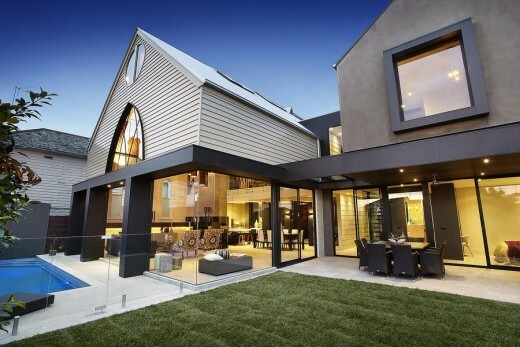 Their brief was to convert a former 120 year old timber church and create an inspiring, artistic & luxurious home that respected the churches spatial qualities, distinct internal features and past history while creating contemporary additions that sat harmoniously together. The concept involved retaining the original church that was built to one side of the site and demolishing a rear redundant lean to and an adjacent multi-purpose non-descript hall. This would allow the creation of a contemporary side addition and a central glazed entry that would form delineation between the old and the new. Of fundamental importance was the retention of as much of the original fabric of the timber church structure & highlight key elements such as the internal timber panelling, trusses & spatial volumes while inserting contemporary design solutions that didn’t detract from the church architecture. 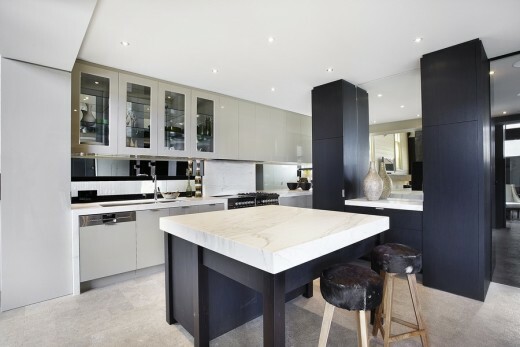 The use of natural materials throughout the project such as limestone, marble, granite, timber & feature mirrors including recycled timber was part of the architects’ philosophy to be true to the material & is a key to the project’s success to create a warm & inviting home. 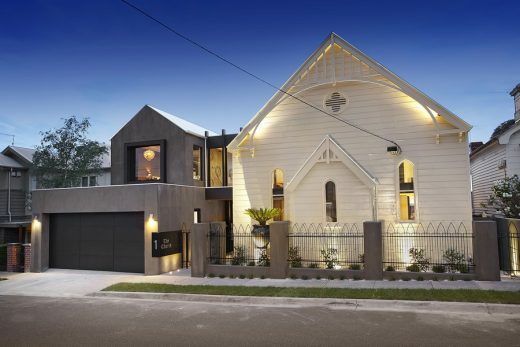 The site’s unique qualities include the large scale footprint of the church and its former function as a place of congregation on only a small 417 sqm suburban site, the sloping block from front to rear and its heritage listing. These constraints allowed for creative interior & exterior design solutions while maintaining the essence of the original architecture. Therefore the design concept involved the manipulation of the spatial qualities of the church by adding mezzanine levels, private rooms & designated areas for modern living without losing the fabric of the church interior. 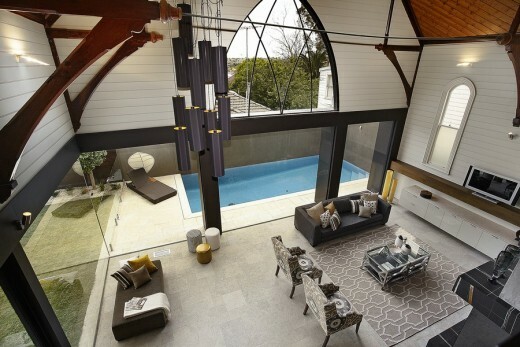 This was achieved with the use of mirrors that reflected existing surfaces, transparent glazed walls and sculptural elements & inserting contemporary finishes, producing a multi-level home that incorporates beautiful rooms that seem to merge with one another to create the most graceful and inspiring space for entertaining and enjoying the ambience of volume and light. 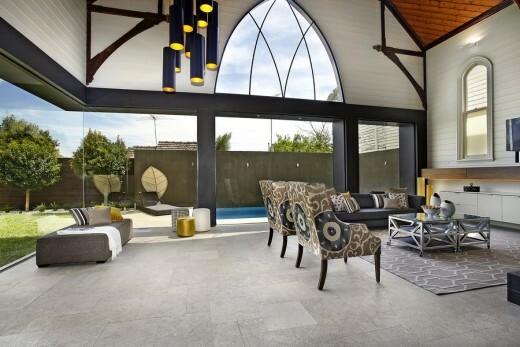 The church space houses an open plan living/meals and kitchen with butler’s pantry and formal living/home theatre room with side vestibule with panoramic views of the north-west garden, alfresco area and feature solar heated pool via vast floor to ceiling glazing. 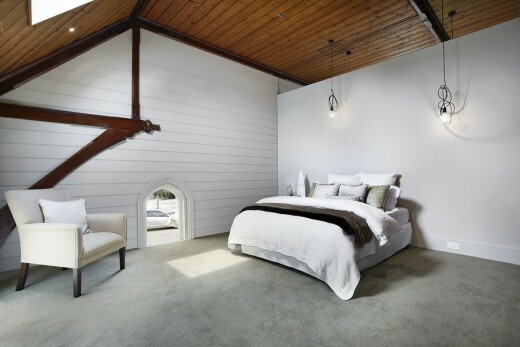 A mezzanine level within the volume of the church houses two huge bedrooms with built in joinery opening onto a rumpus room and adjacent bathroom overlooking the living room void and large arched window to valley views of the area. 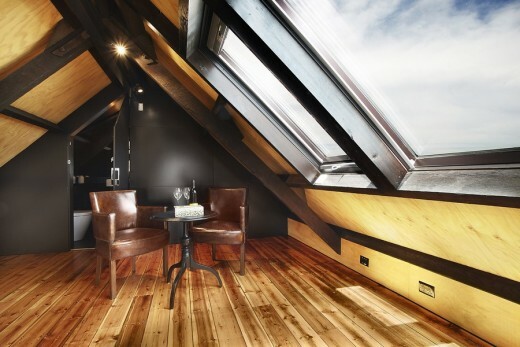 The roof space within the timber trusses of the church has been converted into a New York loft space and is accessed via a staircase in the rumpus area below. It is a multi-functional room with its own kitchenette and private ensuite. Openable skylights and a circular floor to ceiling window encapsulate a panoramic view of the valley & city skyline. 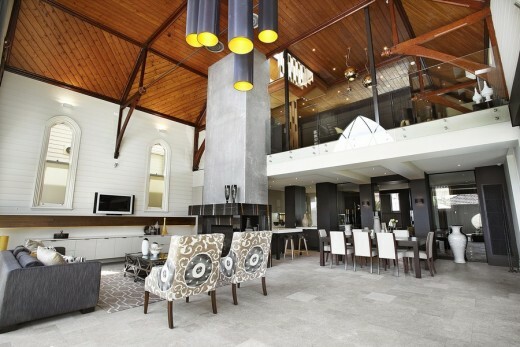 The contemporary adjacent addition is connected to the main church building via a glazed central link housing an amazing basement dining room cellar with polished concrete floor, feature curved re-claimed timber ceiling, mood lighting, floor to ceiling wine racks and a back lit onyx marble wall creating an ambience of absolute luxury. The basement is complimented by an adjacent multipurpose room that can be used as a gym with its floor to ceiling mirrored wall, raised day bed within a cosy wall niche and recessed TV wall. A powder room completes the lower level area. The ground floor of the contemporary addition houses a double garage with built in cupboards, a large laundry with adjacent laundry chute, a luxury powder room and a guest bedroom that can be used as a study overlooking the garden. 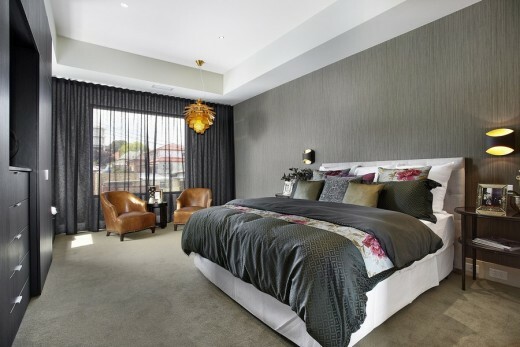 The 1st floor is dedicated entirely to the huge master bedroom wing with a walk in robe and entire wall of integrated joinery incorporating TV, desk and window seat all in the ambience of feature lighting. A large adjacent ensuite with free standing bath tub and double bowl vanity unit and floor to ceiling marble & stone completes the theme of a luxury hotel retreat. Why was the space converted from one use to the other? There are many buildings and individual spaces that have outlived their original use. In the case of the church, the Anglican denomination decided to close the seldom used timber church which was situated in a residential area. It would have been easy to demolish but the spatial qualities of the church allowed it to be manipulated so that alternative uses could be made. For instance the void of the church created an ideal space to house a mezzanine level that accommodated bedrooms and bathrooms while still retaining the vast void. The roof of the church was such that it was a dramatic space for a loft able to be used for multiple purposes. 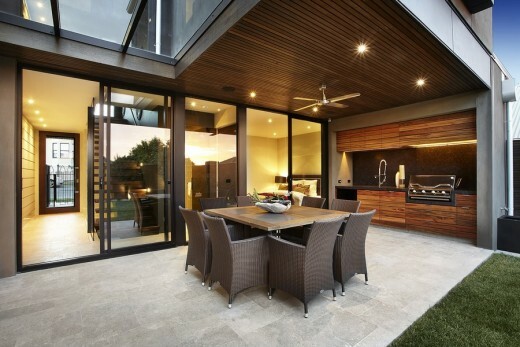 While the ground floor of the church created a space that contained the living, kitchen and family areas that merged into the outdoor spaces which is a feature of Australian lifestyle. In essence changing the space for alternative use be beneficial in that it allows for spaces with particular attributes to be enjoyed as a different function. 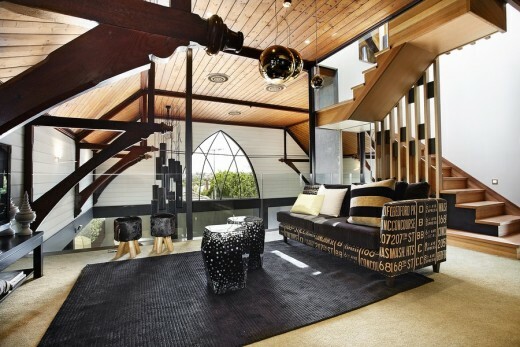 How homes are evolving to meet contemporary lifestyles. If we look at specifically converting former spaces or buildings and why they are used to meet contemporary lifestyles, the answer is that people are now starting to understand that if a building or space has outlived its particular use, there is scope for conversion. With the conversion you sometimes inherit all the constraints and the design details that you would not normally have when designing a new building or space and this creates fantastic opportunity. 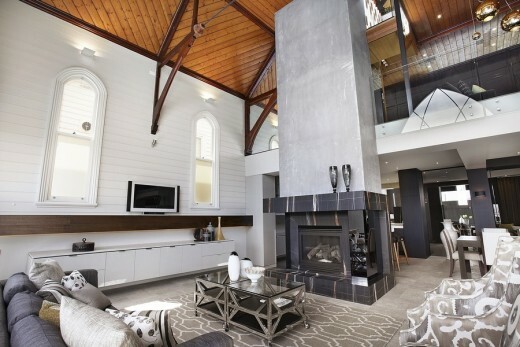 The opportunity to enjoy for examples the spatial qualities of a converted church, the rawness of a converted factory or warehouse or the rustic detailing of a converted barn or out shed. 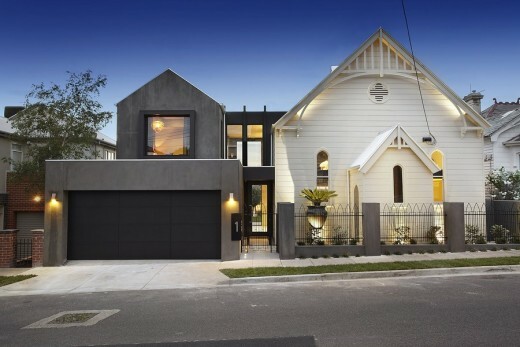 These redundant buildings are evolving to meet contemporary lifestyle. Families are also demanding more from their designers and from spaces not traditional found in homes in the past such as rooms for media, library, chill out zones for kids and even second kitchens. Its conceivable that rooms of the future and we are seeing it now in our own practice, that rooms will have dual use. 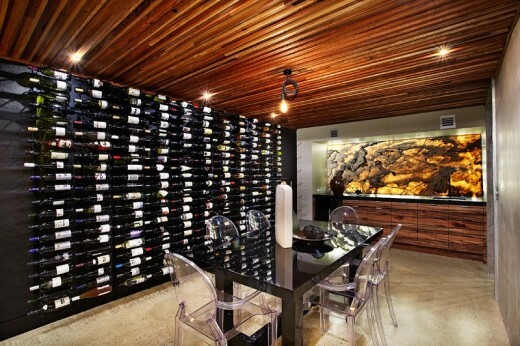 For example are car garage is a home office when the car is not parked inside or a study becomes a media room. Families are demanding more versatility and flexibility. 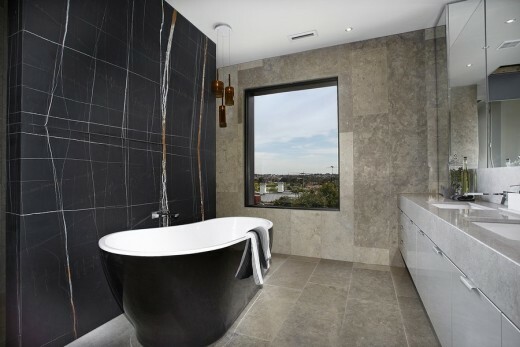 •	Extensive Custom Made built in joinery to all bedrooms/living rooms & throughout. •	Reverse cycle refrigerated ducted heating & cooling. •	Designer Tapware & sinks including heated towel rail. •	Direct plumbed natural gas Stainless Steel B.B.Q. •	Feature exposed Oregon trusses & timber lined ceiling. •	14m x 4.3m New York style roof loft with exposed timber trusses feature timber ceiling & skylights with views of the valley & city. Bagnato Architects was formed in 2007 by husband & wife team Dominic & Marie Bagnato after more than 15 years in previous practices. 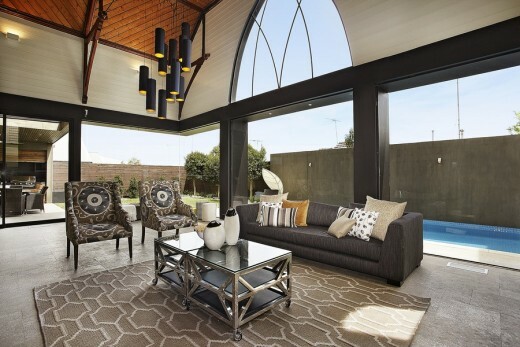 Both designers graduated from The University of Melbourne in 1992 with Marie embarking on a career with some well know Melbourne Architects and Dominic setting up private practice immediately. The firm is dedicated to design excellence with a strong focus on client service. 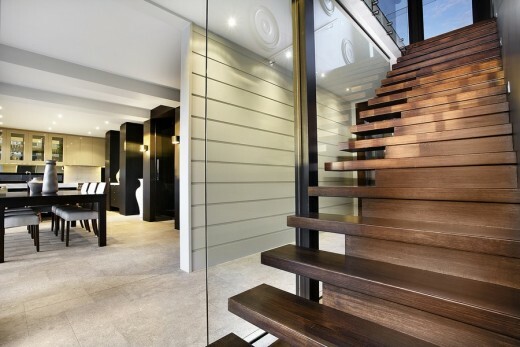 Based in cosmopolitan Carlton Victoria the practice has become renowned for inspiring architecture and interiors with a signature of luxury using natural materials & luxurious finishes. With expertise in architecture, interior design & construction the practice has evolved to become known for its creative design solutions, stylish interiors & innovative planning, a signature style resonating in all their buildings.